This past Thursday I attended a press preview of Zaytinya’s third annual Grape Festival, a two-week long event running from September 22nd through October 5th. As an ode to the most popular fruit of the Mediterranean, the festival will feature a menu inspired by the grape, along with wine tastings and a grape-tastic specialty cocktail cleverly named “There’s More than One Way to Skinos a Grape”, created by ThinkFoodGroup’s very own cocktail guru Juan Coronado. This year, the festivities will end with a bang at the Greek Harvest Patio Party on October 5th, where guests will apparently be able to stomp around on grapes while dancing to live music and enjoying grape-inspired snacks. Needless to say, I will be there. I am happy to report that the press preview was very well organized and I recognized quite a few familiar faces (and that big, curly head of blonde hair, of course) from previous industry parties. 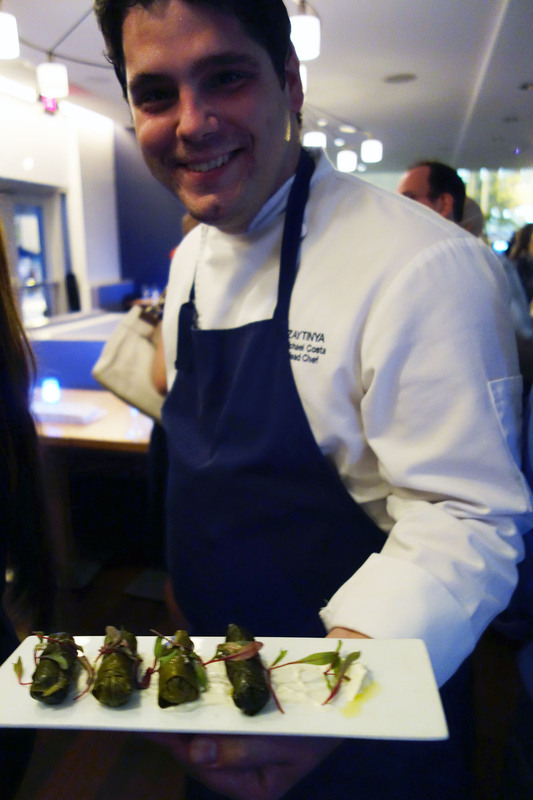 The service was exceptionally good and very knowledgable about the canapés they carried. One of them even went back to ask the kitchen whether they could prepare an extra tray of what ended up being my favorite, just so that I could have one more bite (I had two). Head Chef and José Andrés’s conceptual brainstorm buddy Michael Costa was very much present throughout the event, taking time on a busy Thursday evening to come explain the point of the festival and the concept behind some of the bite-sized numnums featured. 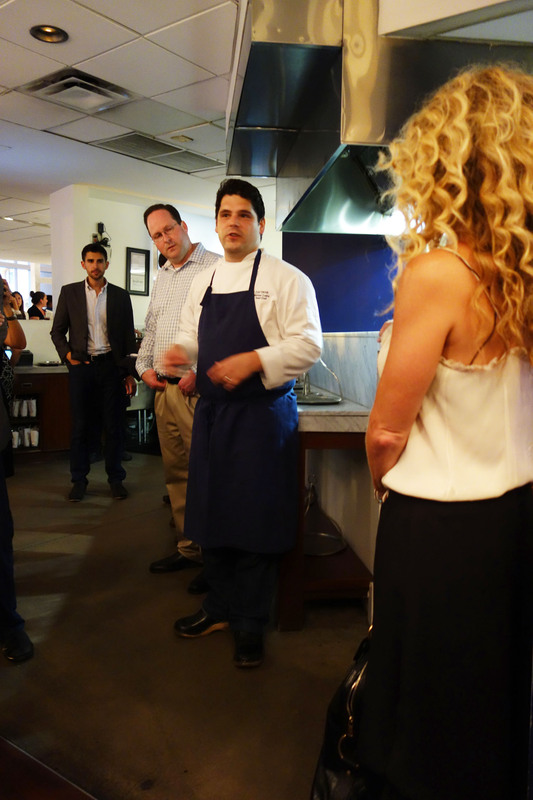 He also mingled expertly, seemingly answering all questions raised and even ended up chatting with me about the texture of grape leaves and the ways in which they can be incorporated into a salad. At one point he asked if I had tried his twist on the classic dolmades (rice stuffed grape leaves), then rushed back to the kitchen to grab a plateful. Our first bite was the Garides Me Ouzo (or was it Garides Me Raki?) 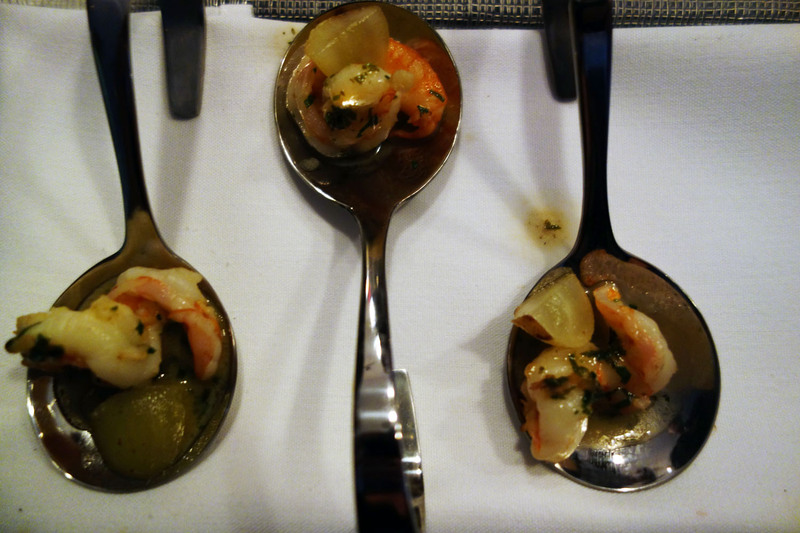 which had baby shrimp flamed in anise-scented raki, a Lebanese liquor quite similar in its flavor profile to ouzo. For a minute I thought I heard they were infused with rakia which, as a proud Eastern European chick, I am quite fond of. I wasn’t too happy when I found out the flambé-juice was actually something from the licorice-flavored-booze category, as I also belong to the category of folks who simply cannot stand anise. I understand why other’s would love it; it’s an acquired taste like uni or Époisses or brains – all of which I adore! But alas – no absinthe, pastis, or sambuca for me! Luckily, most of the anise flavor had either been burned off along with the booze or was simply overpowered by the tart lemon juice pooling at the bottom. There was a bit too much of the latter in the first two bites of the shrimp I had, but the citrus flavor became slightly less potent by the end of the event, which lead me to believe that the kitchen had been alerted at some point and cooled it with the lemons, evening them out a bit with the rich shrimp stock and melted buttah that was also on the spoon. Yay for checks and balances! Sprinkled over the shrimp was also some aromatic tarragon and fresh chive, which pushed the shrimp into a zesty, savory direction. The grapes on this spoon were roasted and warm, adding a caramelized sweetness to counterbalance the lemon instead of just putting in more acidity. 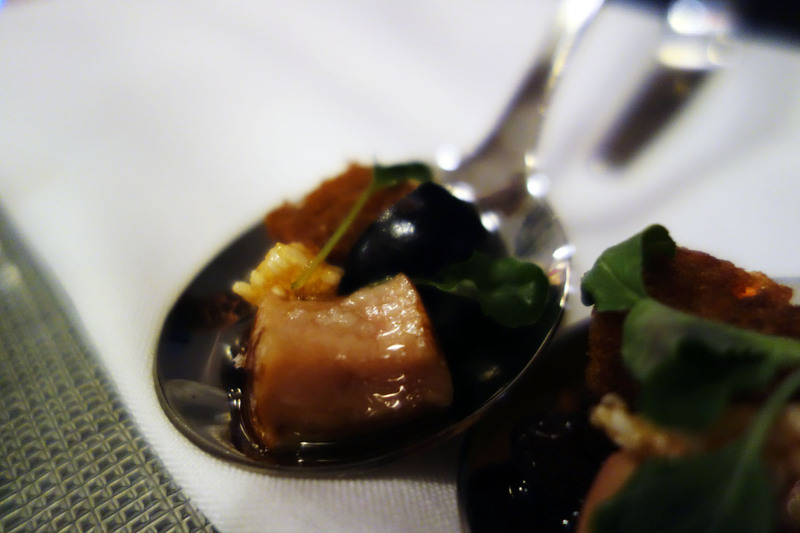 A deceptively complex little dish and a good way to show off the versatility off a not-so-common use of grape. 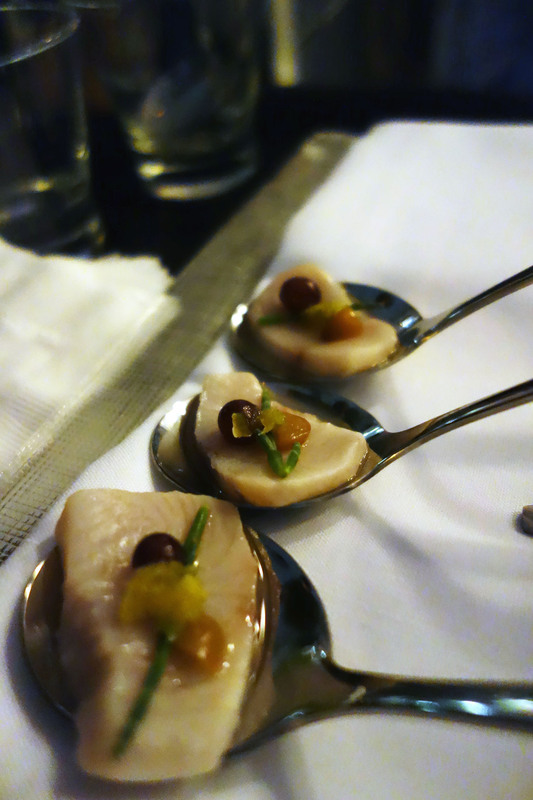 Next came a crudo of hamachi, flavored with a condiment which was a playful take on Japanese yuzukoshō. The latter is classically made of chili peppers, yuzu peel and salt which is left to happily rot away and form a fermented paste that is then used on all sorts of stuff. Zaytinya’s version was made with lemon zest instead of yuzu and jalapeño as the chili pepper. It had a hint of heat from the jalapeño, though didn’t wow me too much with its flavor, perhaps my taste buds had been numbed by a very dry Zinfandel which made it difficult to detect subtle flavors. The fish was quite fresh, wish a wonderful slick, smooth consistency against my tongue. The slice was garnished with a few pickled beads of baby-grape (Zante currants?) as well as some frozen champagne grapes and a single strand of sea bean. The micro-grape had a nice hint of murky vinegar acidity which contrasted against the clean flavors of the citrus – two very different families of sour getting along famously. I enjoyed the sea bean, which reminded me of slightly crunchy, miniature, non-overcooked asparagus and added a good textural contrast to the dish. 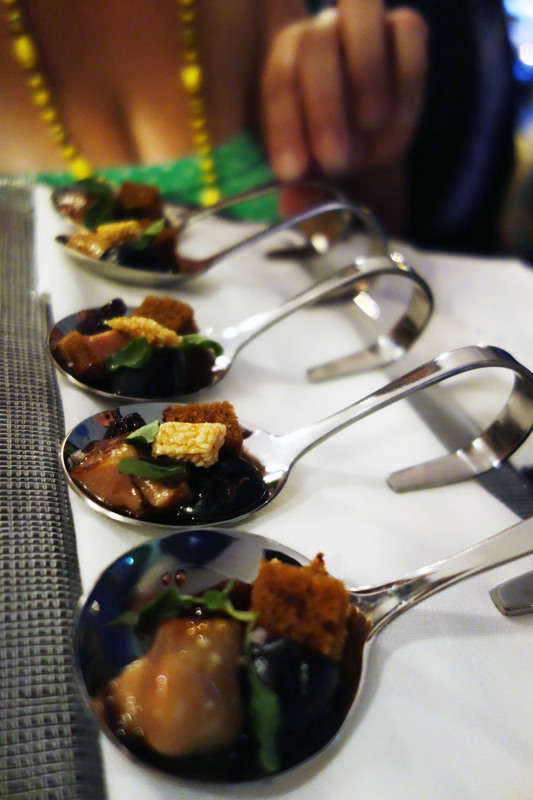 A foie gras dish came next, a jiggly, delicate little cube of it served with a grape molasses spice cake called petimezopita, which is a very traditional (like, Bronze-age traditional) Greek thing, similar to gingerbread or cinnamon-y, autumnal carrot cake. I believe I heard someone explain how the cake is usually served smeared with butter which, in this case, was artfully replaced by the velvety smooth foie. The fat liver melted instantly from contact with my tongue and inundated the the little piece of petimezopita with luscious, savory goose flavor. Also on the plate were a few raisins cooked in red wine until they plumped up and bled out a murky, deep, spicy sweetness that harmonized well with the sweet grape goo in the cake. The latter was lifted by the acidity of fresh Concord grapes. A thin, brittle wafer of sesame halva was added for a crunch and nutty warmth which, when combined with the foie-slicked molasses cake, became something sensual enough to make my eyes close a little. And then there was the Mutancene, seemingly everyone’s favorite. 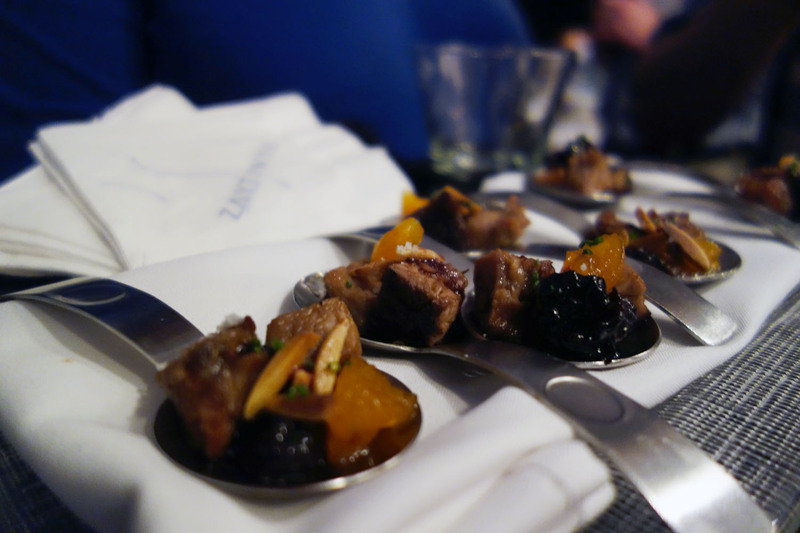 Delightfully petite cubes of Border Spring Farm lamb shoulder braised until fall-to-shreds tender in honey and grape vinegar, topped with crunchy slivers of toasted almond, dried plums and sweet apricots. 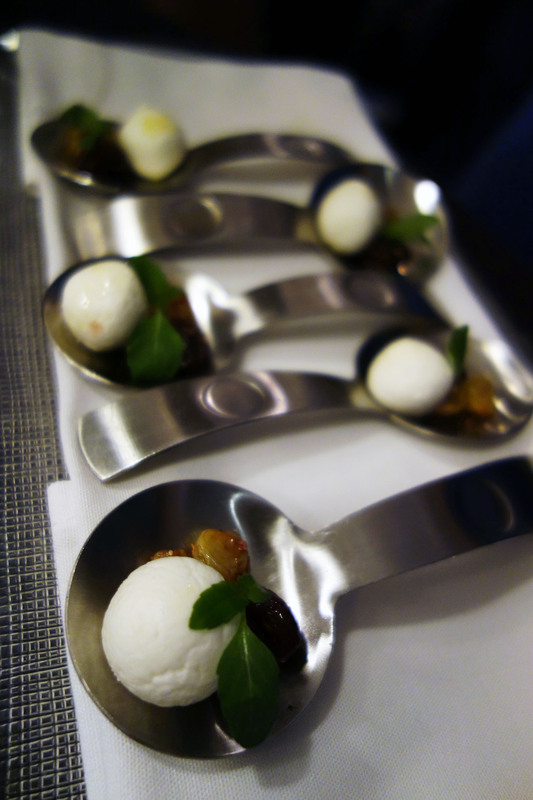 This one was very well constructed – each tiny serving had just the right proportion of everything. The succulent savory-sweet lamb had a plump, juicy consistency and the grape was very much present in the flavor of its vinegar marinade. 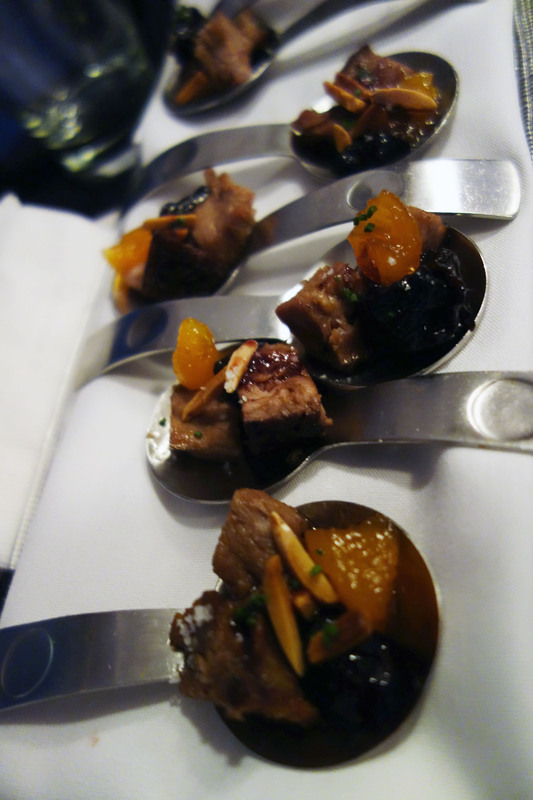 The texture of the meat was accented well by the chewy dried fruit whose sweetness added complexity to the flavor of the bite. The warm slivers of almond brought in a fantastic nutty flavor and a great textural contrast with their crunch. Chef Costa explained that this is actually an Ottoman dish straight off the emperor’s dining room table, one which was eventually adapted into Greek and Middle Eastern cuisines. Definitely one I would recommend to anyone planning to visit Zaytinya during Grape Festival. 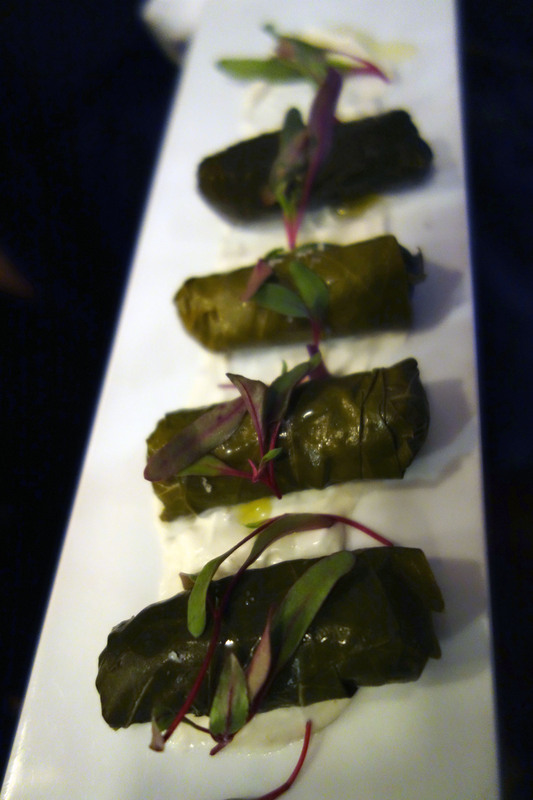 As Chef Costa explained, the filling of Zaytinya’s dolmades change every few months, just to keep things interesting. They are by no means the classic grape leaves stuffed with rice and spices alone. The current version includes pine nuts and butternut squash along with rice flavored with tarragon, and are served on Zaytinya’s signature lemon yogurt instead of the classic egg-and-lemon avgolemono. The yoghurt was delightfully thick and tart, but not overdone with citrus. A hint of caramelized, floral sweetness from the butternut squash balanced fantastically with the toasty pine nuts and the olive-oil flavored tang of subtle acidity so characteristic of grape leaves. Solid logs that become delightfully mushy after a few bites. Definitely not my imaginary Greek grandmother’s dolmades, but a great variation for sure! 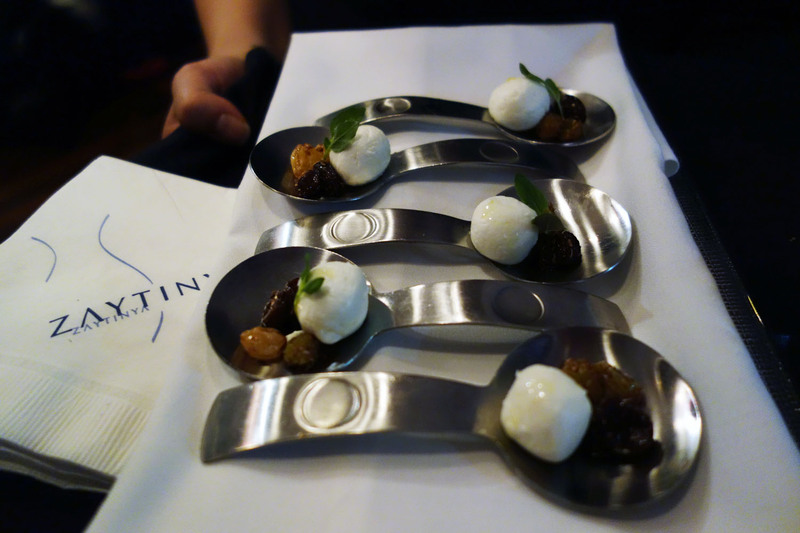 My hands-down favorite snack was the Lebanese-Style Preserved Labne, an airy, fluffy and mind-blowingly creamy ball of muslin-strained cow’s milk yoghurt, served with juicy little golden grape beads and raisins flavored with sticky sweet molasses. The deep, earthy, dirty sweetness of the dark molasses was contrasted perfectly by the clean, refreshing acidity of the snow-white labne. A bit of olive oil drizzled over the latter added a floral note, while the juice bursting forth from the fruit took the acidity of the labne in a sweet direction. As I learned, this was an example of a Greek/Middle Eastern “spoon sweet”, which is classically a spoon of sticky fruit preserves served with tea as a gesture of hospitality in Greece and the Middle East. Not even close to being satisfied by just one of these, I very much appreciated the kitchen sending out an extra tray. Dessert was a Muscat Grape Granita spooned over very airy whipped orange blossom yogurt espuma, topped with thinly sliced grapes and candied orange, a bit of fresh lemon verbena sprinkled over for extra freshness. I actually think the icy cool granita was made out of Concord grapes, as it had that overpowering “grape taste” most often imitated by the purple version of anything multi-fruit flavored. The round flavor of the granita was lifted up by the tangy, subtly citric and slightly bitter yogurt foam. The dessert might have been even better if there had been some sort of crispy carb, crumbled honey-flavored cookie to give the thing a warmth to contrast the cool, tangy flavors. It was still a delightfully light, yet very satisfying dessert that brought sweet closure to the night. Fun from start to finish with a good variation in flavors and textures, keeping only one commonality, the true star of the night: σταφύλια. Grape appeared in multiple forms throughout the event – as a leaf to wrap things in, as an infuse-ador of vinegars, the base of a syrup – roasted, and pickled and frozen and fresh. 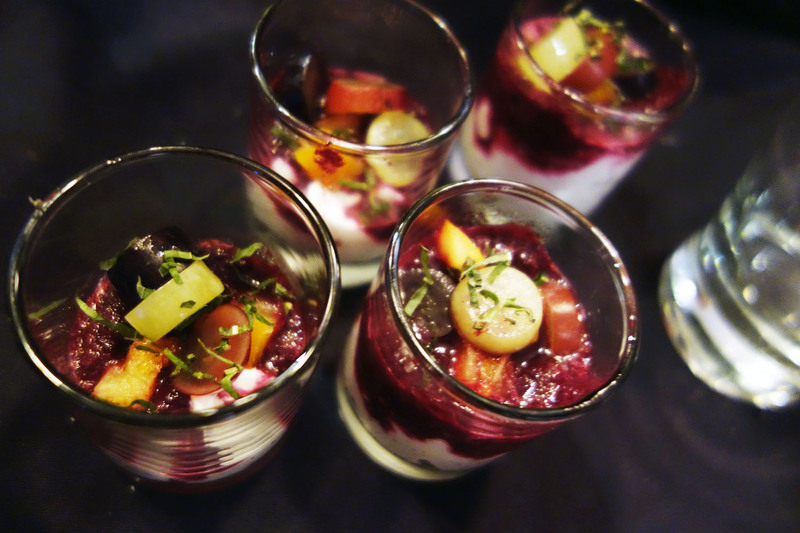 Though each little spoonful wasn’t necessarily about the grape element that formed part of it, the fruit was definitely a theme that recurred throughout the meal enough to make one appreciate the versatility of it as an ingredient. So I guess the culinary team did a good job in executing their plan. The night definitely got me in the mood for harvest season.